Strings quilts have long been a favorite of mine and this project fits in nicely with my interest in trying just about every variation I can think of. My favorite quilts tend to be very scrappy and usually from traditional patterns and string quilts certainly fall in both categories. My first string quilt was made from a pattern in the book Great Lakes Great Quilts (my version was not nearly as bright as the one in the book). Although I love multicolored string quilts, I frequently experiment with color. The colors for this next quilt were chosen after reading a magazine article that discussed using fabrics from half the color wheel in a quilt. Well they used the *warm* side but I tend to like the *cool* side better so I pulled all my blue, green, purple and yellow strings for this quilt. Don’t you love the scalloped border on this one? Anyone following my blog realizes that I do very little applique and no needle turn EXCEPT for these scallops (that means they’re really easy!). 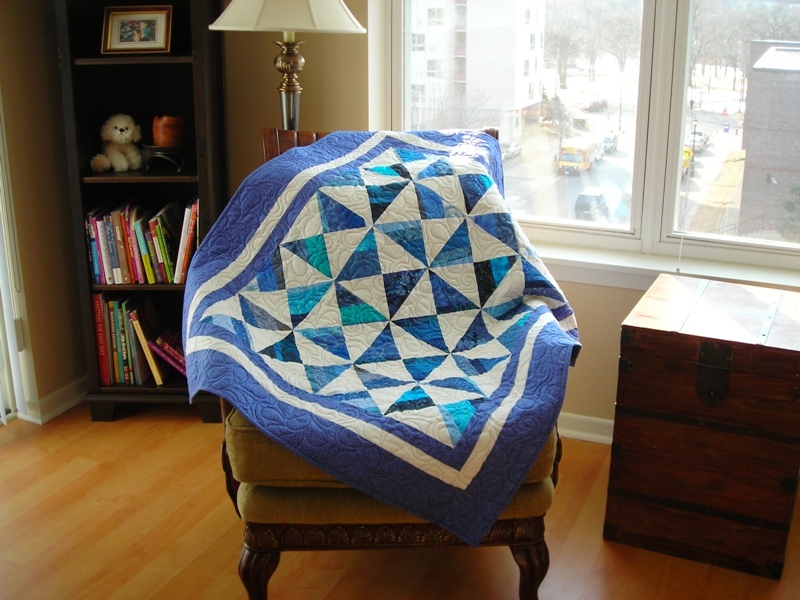 This pattern was in an issue of Quiltmakers All Time Favorites for Kids magazine. Another experiment in color led to this next quilt. I was making blue string blocks and as I got about 1/2 way through making the blocks I wasn’t sure I was going to like the quilt. I searched through my books and came across an Hourglass string quilt in Gwen Marston’s book Liberated Strings and decided that would work just fine. 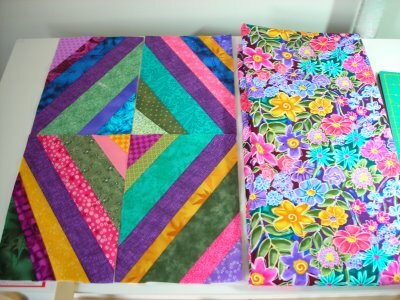 Once I started cutting and sewing the hourglass blocks, I changed my mind about the original quilt and made both. You can see my Blue Strings here. A more recent experiment with color came when I decided to make a quilt using a rectangular block. I pulled a border fabric from my stash that I’d been trying (unsuccessfully) to use in a quilt for several years and rummaged through my strings for all the colors in the border. Here you can see the first 4 blocks along with the border. The final quilt top can be seen here. 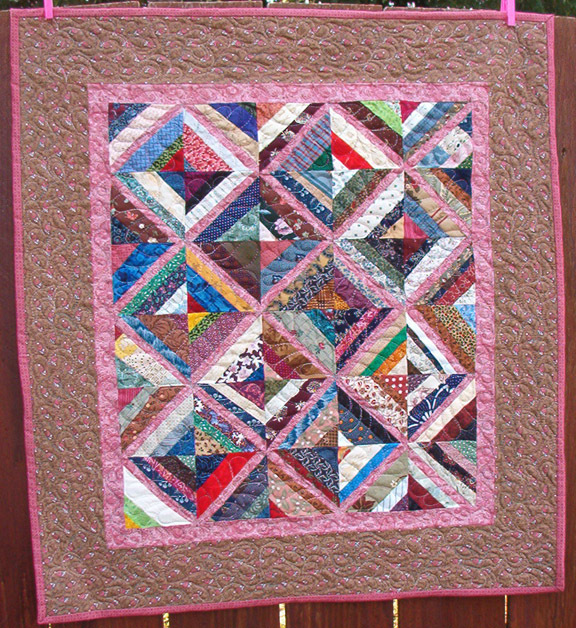 You can keep up with my current quilts via my blog Making Scrap Quilts from Stash. Finally, Blogger and Picasa web albums play nicely together and have automatically created a web album with all the photo’s posted to this blog. To view them all together click below (and bookmark) the HeartStrings Quilt Project blog album. I’ll warn you that making string blocks is addicting but if you’re ready to begin we’ll point you to Bonnie Hunter’s Quiltville site where you’ll find a String Quilting Primer to get you started. If you plan to make blocks to mail in for HeartStrings group quilts PLEASE read the guidelines first as Bonnie’s blocks are constructed with a few differences. 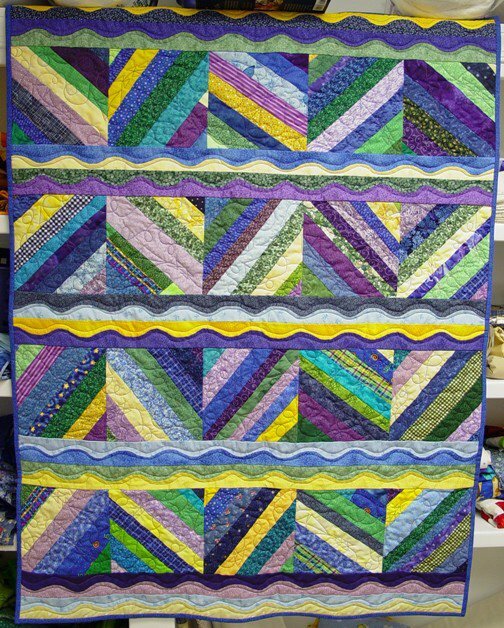 However, if your plan is to make the top and request it be quilted by a volunteer quilter or if you’re making the entire quilt yourself then any method, any string pattern goes! This Basketweave Strings is one of my favorites from Bonnie’s site. 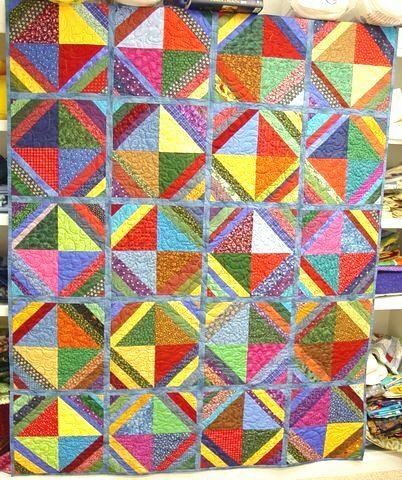 Don’t forget to take a look around while you’re at Quiltville.com, Bonnie has a lot of great non-string quilt patterns and quilts too and you can follow her current projects on her blog. 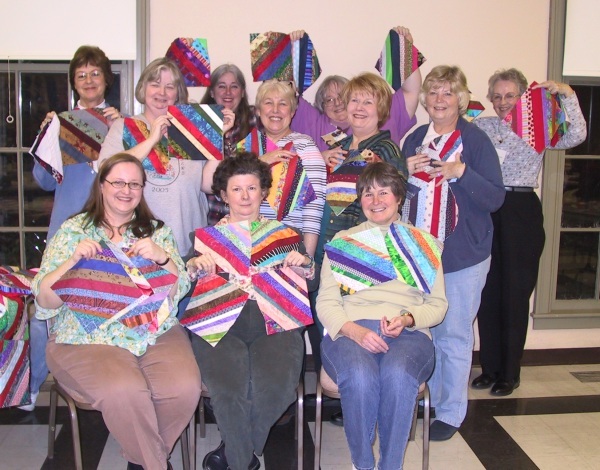 Author MaryPosted on March 21, 2007 April 20, 2018 Categories Uncategorized2 Comments on New to string quilting? I just realized that comments were set for registered users only. I’ve now corrected that and ANYONE can comment. If you have a question for me, I ask that you include your email with your comment or use the link on the side of the page to email me so that I can respond back to you. 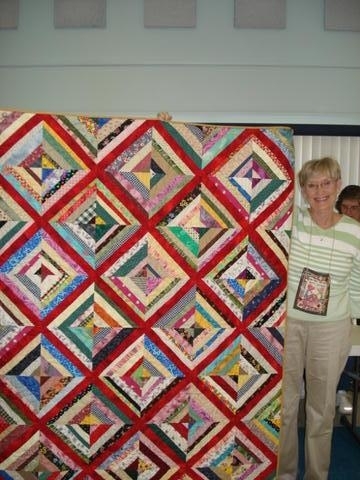 Kitty recently posted a photo of a HeartStrings quilt that she is donating to the Tampa VA hospital. 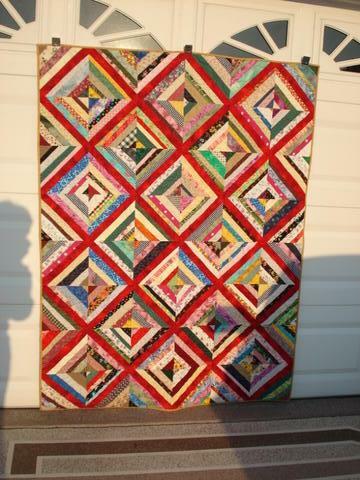 She used the red center blocks made according to the guidelines on her quilt and it’s just beautiful. The top was quilted by a longarm quilter in her guild and she commented that she’d shown it at her guild’s show and tell and even included a photo for us to see. Kitty also had a great tip for hanging quilts up to take pictures. She reported that she bought 3-4 large magnetic clips from the office store and used them to take a photo against her metal garage door. Great idea! For those of you in guilds, don’t forget to take your HeartStrings tops or quilts in and share information about the project. You can refer people to the HeartStrings website and from there they can find links to the Yahoo group and this blog. 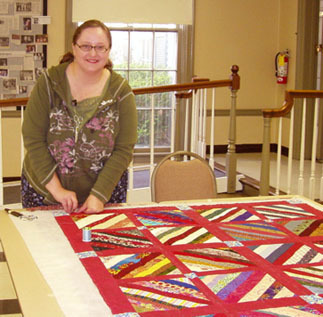 For more information about QOV – visit the Quilts of Valor website. For the HeartStrings guidelines for making string blocks like those Kitty used click here. 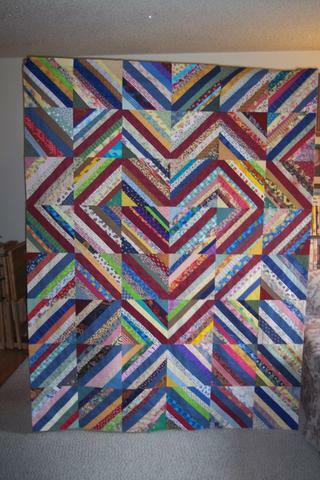 Michele contacted me by email to share her HeartStrings Project quilt. 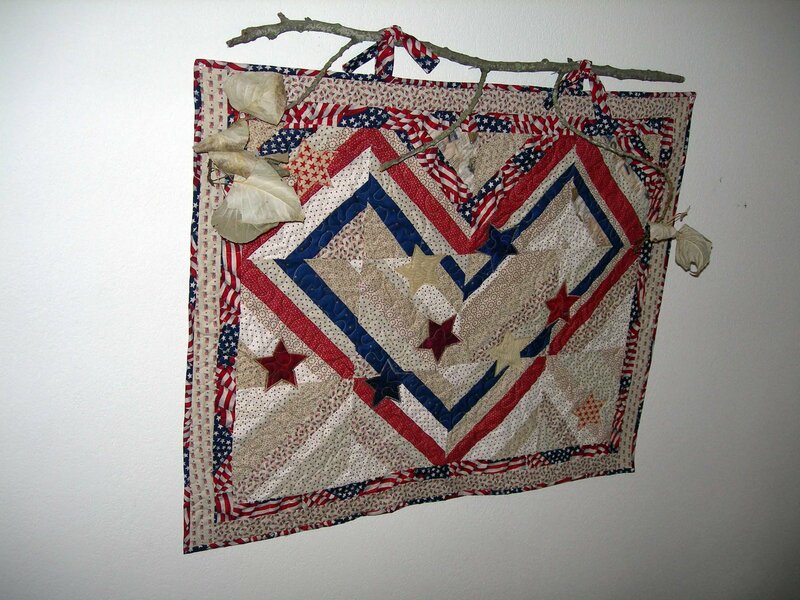 She’s participating via the HeartStrings Quilt Project website rather than the Yahoo group and I wanted to share the quilt she made to be donated to the Veteran’s Outreach Program in Salem, Oregon.